WASHINGTON (AP) — To hear President Donald Trump tell it, he was made for a moment like this: A high-stakes face-off. A ticking clock. A cagey adversary. The man who calls himself a supreme dealmaker will have the opportunity this week to put himself to the test. The question is whether he can defuse a trade war with China that is shaking financial markets and threatening the global economy — and perhaps achieve something approximating a breakthrough. Most analysts have said they doubt Trump and Xi will reach any overarching deal that would settle the dispute for good. The optimistic view is that the two sides may agree to a cease-fire that would buy time for more substantive talks and postpone the scheduled escalation in U.S import taxes. Yet no one really knows. Each side seems prepared to wait out the other in a conflict that could persist indefinitely. Most trade analysts are skeptical that any significant agreement is likely this week. The trade war erupted last fall after Trump imposed import taxes on $250 billion of Chinese goods, and Beijing retaliated with tariffs on U.S. exports. 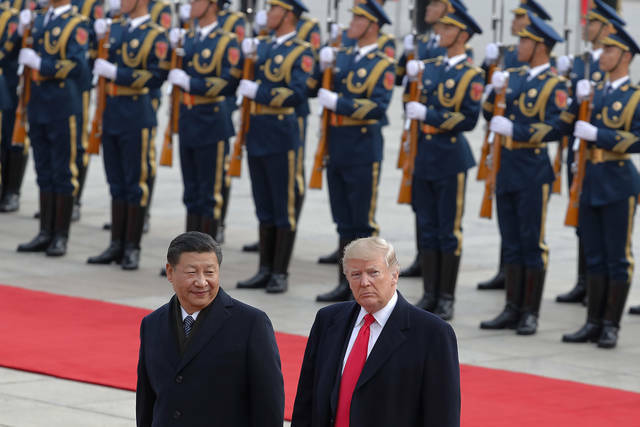 The justification for the U.S. move, according to Trump, is that Beijing has long deployed predatory tactics in its drive to supplant America’s technological dominance. The administration alleges — and many trade experts agree — that Beijing hacks into U.S. companies’ networks to steal trade secrets and forces American and other foreign companies to hand over sensitive technology as the price of access to China’s market. Beijing disputes those allegations and asserts that Trump’s sanctions are merely an effort hinder an ambitious rival. Besides the scheduled escalation in U.S. tariffs on $200 billion in Chinese goods — an additional $50 billion in Chinese imports already face the higher tax — another threat looms: Trump has threatened to tax $267 billion more in Chinese imports. At that point, just about everything Beijing ships to the United States would face a higher import tax. Growing concerns that the trade war will increasingly hurt corporate earnings and the U.S. economy are a key reason why U.S. stock prices have been sinking. As of Friday’s close, the Standard & Poor’s 500 index has shed roughly 10 of its value since setting a record high Sept. 20. Some big U.S. companies, in reporting quarterly earnings in October, warned that they were absorbing higher costs from Trump’s increased tariffs, which have been imposed not only on Chinese goods but also on imported steel and other goods from other countries. Yet as Trump and Xi prepare to meet, the backdrop is hardly encouraging. Acrimony between the two sides disrupted this month’s Asia Pacific Economic Cooperation summit in Papua New Guinea. The 21 APEC countries, torn by differences between Beijing and Washington, failed to agree on a declaration on world trade for the first time in nearly three decades. Vice President Mike Pence and Xi sniped at each other in speeches. 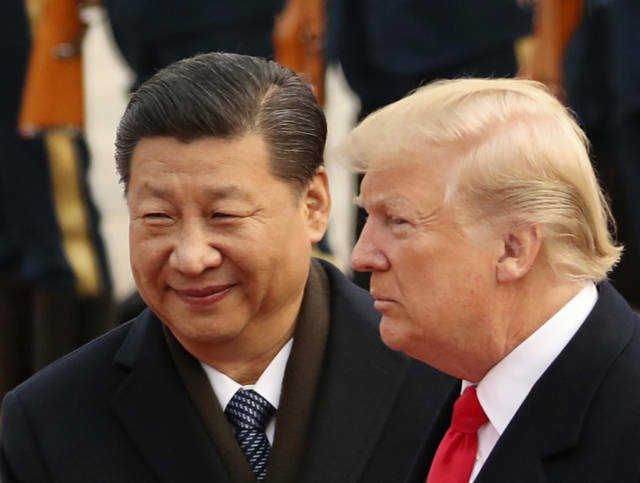 Then last week, U.S. Trade Rep. Robert Lighthizer issued a report charging China’s efforts to steal U.S. trade secrets have “increased in frequency and sophistication” this year despite American sanctions. “China fundamentally has not altered its acts, policies, and practices related to technology transfer, intellectual property, and innovation, and indeed appears to have taken further unreasonable actions in recent months,” the report concluded. The tenor of the report suggested that the United States would take a hard line into this week’s talks. In the meantime, “the amount of uncertainty is unprecedented and very disquieting to the markets,” said Allen of the U.S.-China Business Council. Clouding the outlook is are mixed messages from the Trump administration itself. The White House appears divided between hawks like Trump’s trade adviser, Peter Navarro, and free traders like the top White House economic adviser, Larry Kudlow. On Nov. 9, Navarro delivered a combative speech suggesting that Trump didn’t care what Wall Street thought of his confrontational China policy. Regardless of which approach Trump takes to Buenos Aires, Trump and Xi don’t have to resolve their differences this week. A cease-fire that suspends any further escalation of the U.S. tariffs wouldn’t be unprecedented. The administration and the European Union, for instance, reached a truce last summer that suspended threatened U.S. tariffs on European auto imports. “My personal guess — and I’m sticking my neck out here — is that there will be some kind of cease-fire agreed to,” said Matthew Goodman, a senior adviser on Asian economics at the Center for Strategic and International Studies. Goodman noted that Trump appears concerned about tumbling stock prices, and Xi is contending with a decelerating Chinese economy. A truce would bring at least a temporary calm. Garrett Carr does not work for, consult, own shares in or receive funding from any company or organization that would benefit from this article, and has disclosed no relevant affiliations beyond their academic appointment. Queen’s University Belfast provides funding as a founding partner of The Conversation UK. I grew up near Ireland’s border when it was a hard border, though we had yet to learn the term. The border was guarded with customs posts and military fortifications, and often there were searches and questions. Many people are determined to avoid seeing such infrastructure on the border again after the UK leaves the EU. The new draft deal between Theresa May and the EU seems to have been shaped in important ways by this determination. Assuming that the deal is accepted by Westminster – a big assumption – there is still a lot left undecided in the 585 page document, and gaps to be filled during future negotiations. What will Ireland’s border look like after Brexit? It still feels as if anything is possible. The border was created in 1922 when 26 of Ireland’s counties became an independent state, while six remained in the United Kingdom. It was a hard border to some extent or another until two events in the 1990s: the peace process and the creation of a customs union across Europe, including both parts of Ireland. Ireland’s border got me thinking about aspects of place and space. Not all coordinates are equal. Two Irish hedgerows might look the same, with the same March songbirds and September berries, but one is just a hedgerow, whereas the other might be the frontier between two countries. That hedgerow is actually marked on the map, with a borderline symbol that is loaded with meaning and contention. Recently I returned to Ireland’s border to walk it, map it and write a book. I was interested in the people for whom the borderland is home. I became fascinated by paths they had cut across this invisible line, and the homemade bridges they had placed across streams that straddle the 310-mile border. In contrast, I also mapped the border’s defensive architecture. My project took on some urgency when the UK voted to leave the EU, when suddenly this border of rivers, bogs, farms and forests became central to the way that would happen. It had always been my intention to give border voices a platform, and now more people were interested in listening. This year, American Suzanne Lacy was artist-in-residence for the Belfast International Arts Festival and was commissioned to produce work on Ireland’s border, in collaboration with border communities. Lacy is an artist of public practice – by getting people together for discussions, events, activities, she choreographs conversations. She brought me on board for part of the project called the Border People’s Parliament. This event was held in the grand marble hall of Stormont, Northern Ireland’s parliament. We gathered around 150 people from the borderland, aiming for a mix of backgrounds and ages. On the night we ate a meal together and I conducted some interviews and made recordings. Participants were asked to consider various questions about the borderland and their lives on it. For the last part of the night, they were given sheets of paper on which to respond to our questions. Some wrote postcard-length comments, others extended letters. I was charged with taking their words and distilling them into a single border people’s manifesto. In creating the manifesto, I wanted to use border people’s own phrases, with as little meddling as possible. I changed the point-of-view voice into first person plural – “we” and “our” – but in every other way endeavoured to be true to the source material, capturing both the overall message and the language in which it was expressed. I also wanted to capture some of the tone and the accent of borderland voices, hence the appearance of well-worn phrases such as: “You don’t rush border people”. The manifesto had to be turned around quickly and I had no idea at the beginning whether it would be a smooth or difficult task. I don’t think anything like it had been done before – and certainly not on Ireland’s border. I had been concerned that there would be much disagreement in the comments – equally valid but oppositional statements that would never sit together in the same document. But this was not really an issue in the end. There were pro and anti-Brexit voices, but both were united in calling for the border to remain open whatever the future. The term “invisible border” was used often. Points of pride emerged. The border landscape’s beauty was often mentioned alongside a desire to preserve it. Border people’s tolerance, neighbourliness and an ability to get along despite political differences were frequently referenced. Several said that we should all learn history – learn it so we don’t have to repeat it, but at the same time remember to live for the future. All of this and more went into the nine points of the manifesto. The colour yellow was a theme of all Suzanne Lacy’s Across and In-between border projects (which also included a film, The Yellow Line, projected on to the side of the Ulster Museum in Belfast) and so the document came to be called the Yellow Manifesto. It has proved popular on social media and in the press after being launched on BBC Radio 4’s Today programme by Lacy on October 23 2018. Immediately afterwards she travelled to the Houses of Parliament and gave copies to MPs. In Westminster it seems the border is constantly discussed – but only as a problem or an obstacle to Brexit. For me and the population of the borderland, it is important to let people see that it is also a home, the basis of livelihoods and even a place that is loved. Good to see that the Irish border is still a source of creativity. If only Spike Milligan was here to write a sequel to Puckoon ( a fictional village straddlling Ulster and Eire), one of the most creative novels I have read as well as by far the funniest. Brexiteers have produced farce and absurdity about the border in Ireland, but sadly no humour. Alexandra Staub does not work for, consult, own shares in or receive funding from any company or organization that would benefit from this article, and has disclosed no relevant affiliations beyond their academic appointment. When large companies move into an area, politicians often proclaim how the new business will create jobs, increase tax revenues, and thus lead to economic growth. This is one reason local governments offer tax incentives to businesses willing to move in. Amazon’s decision to locate offices in Long Island City across the East River from Manhattan, and in Crystal City on the outskirts of Washington, D.C., follows this pattern. The New York location borders the largest low-income housing area in the United States, with mostly African-American and Hispanic residents whose median household income is well below the federal poverty level. These people, local politicians claim, will benefit from Amazon’s move to the neighborhood. However, when large companies with an upscale and specialized workforce move into an area, the result is more often gentrification. As economic development takes place and prices of real estate go up, the poorer residents of the neighborhood are forced out and replaced by wealthier ones. Is such a market-driven approach that accepts displacement ethically justifiable? And how do we even measure its costs? Can gentrification ever be ethical? Although politicians don’t typically frame gentrification as a question of ethics, in accepting the displacement of poor residents in favor of better-off residents they are, in effect, making an argument based on ideas of utilitarianism. Utilitarianism, developed as a modern theory of ethics by the 19th-century philosophers Jeremy Bentham and John Stuart Mill, seeks the greatest balance of happiness over suffering in society as a whole. Utilitarianism seeks the greatest net benefit in any situation. In economics, it is often expressed in monetary terms. A classic example is of a new dam that will generate electricity, irrigate crops and provide a new lake for recreation. But it might also displace people and flood land that is used for other purposes. Economists might calculate the dollar cost of the dam itself, the monetary value of the land lost, and the cost to relocate displaced people. They would weigh these monetary costs against the value of the electricity gained, the increased food production, and added income from recreation. What economists miss in these calculations are the social costs. For example, they do not count the lives disrupted through displacement, nor do they determine if the benefits of the dam are equally available to all. Gentrification, as an economic and social phenomenon, is not limited to cities in the United States. Gentrification has become a global issue. In cities as geographically dispersed as Amsterdam, Sydney, Berlin and Vancouver, gentrification has been linked to free-market economic policies. Put another way, when governments decide to let housing and property markets exist with little or no regulation, gentrification typically flourishes. When neighborhoods gentrify, politicians and policymakers often point to physical and economic improvements and the better quality of life for residents in an area after gentrification. For example in 1985, during a period of intense urban renewal in New York City, the Real Estate Board of New York took out advertisements in The New York Times to claim that “neighborhoods and lives blossom” under gentrification. Through the lens of utilitarianism, one could say that the population living in neighborhoods after gentrification experience greater happiness than before. The fallacy of this argument is, of course, that these “happier” populations are overwhelmingly not the same people as were there before gentrification. As a scholar who works on questions of ethics in the built environment, I have studied how we, as the concerned public, can better equip ourselves to see through such arguments. Economic development in an area leads to less poverty in that area, not because the personal economic situation of poor people who live there has improved, but because the poor people have quite simply been erased out of the picture. Urban geographer Tom Slater points to a similar disappearing act within gentrification research. Researchers once focused on the experiences of those negatively affected by gentrification. For example, one study of the Williamsburg neighborhood of Brooklyn found that gentrification commonly removed manufacturing from inner city areas, leading to blue-collar workers losing urban job opportunities. Another study found that gentrification was associated with increased social hardships for residents. Not only did their housing expenses rise, social networks disintegrated as neighbors were forced to move elsewhere. In an examination of seven New York neighborhoods, for example, the researchers found that half of the poor households who had remained in gentrifying areas were paying more than two-thirds of their income for rent. Where gentrification research once focused on evictions of low-income and working class residents, housing affordability problems, and torn social fabrics caused through changing neighborhoods, the talk has since turned to the experiences of the middle classes who are doing the gentrifying. Terms like “competitive progress” and “regeneration, revitalization and renaissance” of urban neighborhoods are commonly used to describe a process whereby physically distressed areas of a city have their buildings renovated and updated. Urban planner and best-selling author Richard Florida also focuses on the gentrifiers. In his much discussed 2002 book, Florida maintains that cities with a large gay and “bohemian” population of artists and intellectuals tend to thrive economically. He calls this group of hip and affluent urbanites the “creative class,” and states that they are responsible for a city’s economic success. When Florida’s book came out, city leaders throughout the United States quickly seized on his ideas to promote their own urban renewal projects. When researchers and urban leaders focus on the gentrifiers, the displaced poor and working class are doubly erased – from the gentrifying areas they once called home, and with few exceptions, from the concerns of urban policymakers. Amazon’s move to Washington and New York along with an influx of well-paid employees brings us back to the question of how we might apply the ethical concept of utilitarianism to understand the greatest balance of happiness over suffering for the greatest number of people. In my view, this number must include the poor and working class. In an area threatened by gentrification, the economic and social costs for displaced residents is typically high. To make ethical decisions, we must consider the people who suffer the consequences of rapidly rising costs in the area they call home as part of the ethical equation.